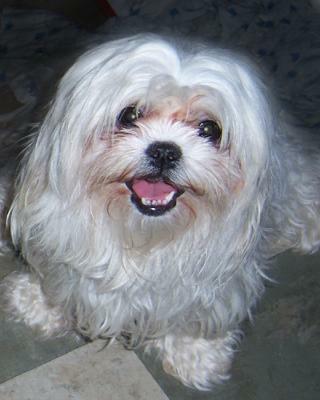 My Pek-A-Tese is very sweet, loving and playful dog. She's also great with my children. She's smart too but what amazes me most with her small size she eats like a big dog. Having Nelly in my life is unintentional. It was Valentine's Day 2009 when I went out with my children just to check out a Pomeranian at the weekend market then I came across this cute little puppy... it was a love at first sight. 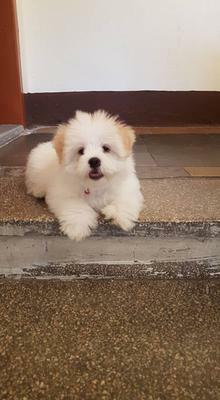 I really don't want to own a puppy that time or in the near future because of my allergies and asthma but I just can't resist her charm without second thoughts I bought her. The seller told me that she's a pure-breed Maltese with her age and size that time, I really can't see if she's a real Maltese and with the seller's assurance and papers I believe her but after a few weeks her features changed so I've decided to consult two veterinarians about her breed, they told me that the seller cheated me about her breed and that she is a Pek-A-Tese or Maltese Pekingese mix. Nelly is precious.I'm sure that she will bring you as much joy as her little heart can give. Our Peke-a-tese is so great that EVERYONE wants her... or one just like her. She is now my mother's "Grandpuppy" and is commonly called "Ragdoll Dog" (like the cat). She regularly just falls asleep and is relaxed and limp in just about any situation or position... even hanging from your hands. She is the most trusting dog, even to SMALL children! The only time we ever saw any aggression in her even once was when we gave her a REAL meat bone, and then tried to take it away from her because it was so messy. She gets along with our cats & even cuddles with them, even though the cats came a few years after Pika did. When we got her she came already potty trained... she was trained with wood shavings! We bought her from a breeder who only had 2 litters of Peke-a-tese. We had to be on a waiting list for 6+ months and then had to drive 4 hours to get her. 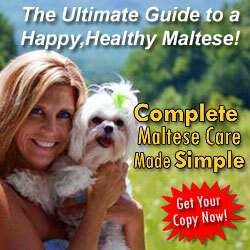 Her mother was a fawn & black purebred Pekingese and her father was a purebred Maltese. Pika is completely white with light cream spots here & there. Her litter mates were all white & cream as well. She is currently 4.5 years old and weighs just under 10 lbs. Her hair/fur is an even mix of Peke & Maltese... silky & straight on her head, ears, tail & underside & chest, and wavy with some wiry hairs along her back & sides. We keep her in a shaggy 'do and brush and comb her often. 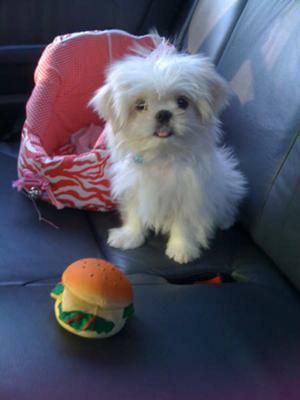 Her face can best be described as an even mix of Peke & Maltese as well. Her nose is not too long, not too short... although she does grunt & snore a little. She has big beautiful brown eyes. She does have a slight underbite and one crooked tooth, but it just adds to her character. You only see her teeth about 50% of the time, and even then only 3 show. She does have runny eyes at times, but we keep the tear stain areas trimmed. We did have extra eyelashes removed by our vet as well. Aside from tooth & eye problems she is a very healthy dog. She doesn't get an upset stomach if she eats something she's not supposed to, and LOVES to ride in the car (without getting sick). She is all muscle and very sturdy! She is longer than she is tall, but not by much. Her back is "flat" like a Peke's, and she has the feathery Peke feet. She does not waddle like a Pekingese at all, though and is quite fast. We just love her to pieces & everyone who's ever met her says there will never be another Pika!!! I've tried to find another... one for me & one for my mother, but to no avail. My mother kept pedigreed Bichons all her life, and just lost one a couple months ago, and now is looking for a Peke-a-tese just like Pika. I joke and say that if we could afford it, we should have her cloned so that there WILL be another Pika. I wish more people would mix these two breeds, because in my opinion they are the cutest & sweetest dogs around! Of course, that could all be due to her upbringing I suppose. She is picky eater please help, thank you! but other time she's good. I wish I could send you a piture of my Missy. She is almost 4 years old and looks just like Pika. We rescued her from a parking lot of the Petsmart here locally. She was only about 5 months old and scared silly. Took her a few days to warm up to me (wife) but now she is a mommas girl and our house Princess. She has had 2 litters and thats it for me. We kept one of her pups, Belle who is almost 2. As for the eye staining we have been able to almost get rid of it by giving her bottled water. Her eyes still drain but not with much staining now. Email me at thehoovers1@hotmail.com and I will share pics with you! later! I think I have your clone! Reading your post on Pika, as my Phoebe is sitting on my lap and I'm giggling. Pika looks just like Phoebe and the personality description is exact!! I will upload a pic of her. She just turned two. 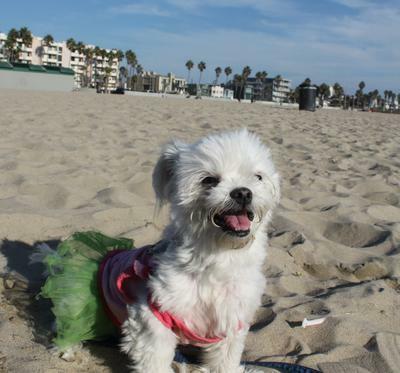 We love her dearly and she is the household "Diva"
I read about Pika and it was like reading about my Peke-a-tese. 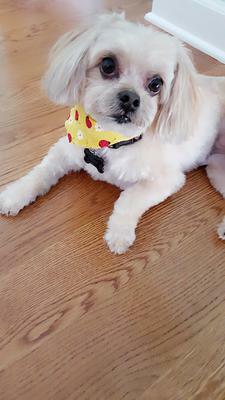 We bought an AKC beautiful tan and black Pekingese female two years ago, then my daughter gave us a registered Maltese male who was the same age as Baby Doll. They fell in love and on her second heat, mated, produced three gorgeous puppies that all looked like Pekingese at birth but now at 8 months look more like Shih Tsus. Your description of Pika fits ours to a T. BeBelle and Kat are both less than 5 pounds; Marley is almost 9 pounds. We tried to keep Baby Doll and Spike apart during her third heat but they outsmarted us and we now have four brand new babies. 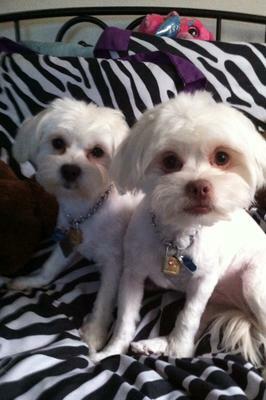 This time there are two that look like Pekes and two that are pure white Maltese looking puppies. These we will sell when it's time. This will be the last batch; two times is enough for any mother! They are the sweetest puppies with all the best qualities of their parents. Spike is a "yapper"; the puppies are calm and quiet like Baby Doll. Spike has silky long hair as do the puppies. They are small like Spike but sturdy like Baby Doll. I LOVE them. Kuddos for Peke-a-tese Pups! Two Paws UP! for Pika! Daisy is a Peke-a-tese and is the best puppy. She is very loyal, and loves to play hard. We have 3 teenage girls in our home, and they love to make over her. She loves her daddy, and he plays all the time with her. She likes to be hand fed. I am not sure if this is a breed specific thing, or if I am creating a Malt a Monster! I don't think that they are hard to train, it's just that it takes almost a year before they are fully potty trained. Something to do with their bladder muscles not developing as quickly as larger dogs. My vet told me to crate train them. That means keep them in a small crate, or kitty carrier while they are small. They get out and first thing they must do is go potty. Then I left him out only a little bit then back in the crate. As he got older, the more time he could stay out of the crate but on a leash attached to my hand. Mine stayed by my bed at night in the carrier and he was happy with that, no crying. I also found it helpful to use the same phrase when telling him to "go". He eventually learned what he was supposed to do. I think the secret to housebreaking is having an everyday routine, taking them out very often and regulary while they are growing which often means you need to be home. And most importantly don't beat them if they have an accident! Bring them to it and tell them NO sharply and they will soon understand that's not acceptable. I think a working couple would find it very difficult to housetrain a puppy. I can't imagine a little puppy holding it for a full 8 or 9 hours. If you are consistant and patient for at least a year, you should be rewarded with a housebroken doggie. We are considering purchasing a peketese, we found one at our local pet store and fell in love.however I keep finding articles stating that they are "hard" to house break..can anyone help with their own stories? Your dog sounds just like mine. My Maltese also likes to be hand fed too and is quite spoiled. Now she won't eat out of her dish. 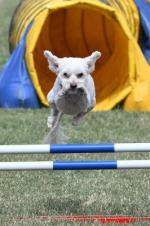 Fifi is a three-year-old Pek-A-Tese born on Valentine's day. She is affectionate and playful, bossy, but also shy. She's a great fetcher and is fiercely protective of her treats. What really makes her fun is that she loves to take showers, baths and splash in puddles. Fifi is a pretty thing and is always friendly to me. Haven't seen her in a while, but next to my Bailey and Sue's dog, she's next in line. Fifi is so fun! She dances for treats just like a circus doggie. She's tough and kicks her brothers butts when they get outta line... They know whos boss. Fifi is the best! 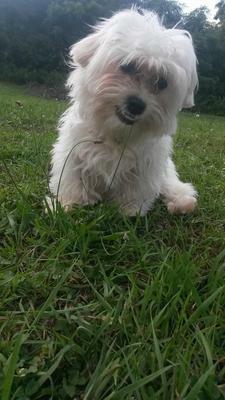 Her cousins Jasmine & Lolly vote for her to be Pek-A-Tese of the month! Fifi is only bossy with her brothers & let's face it, somebody has to tell those boys what to do! She is the queen! Fifi is adorable. I know she is loved by the MB family. I vote for Fifi as the Pek-A-Tese of the month!!! A real cutie. Yanno, just chilling on the beach. My Peke-a-Tese is a smart playful and a monster. His mom was a Maltese and his dad was a Peke-A-Tese. He was really easy to potty train and is a quick learner. But just can't stand being alone. Trying to get him used to being alone but no one can resist his charm. 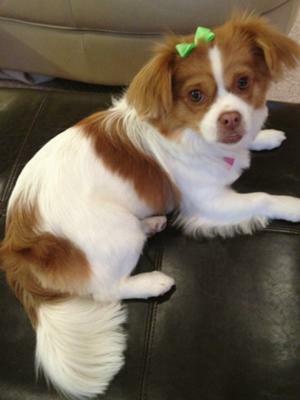 We love our Peke-a-tese named Cinnamon and she just loves everyone especially children. She is almost a year old now is very lovable and loves to give kisses. She has a very out-going personality and gets along well with other dogs. She has helped our 7 year old daughter get over her fear of dogs. Now they are best buddies and my daughter carries her around like a baby. She is a great addition to our family! We bought our Peke-A-Tese in Sept. 2012. We drove 500 miles to get her as we couldn't find a breeder close to us in Atlanta. Her name is Molly and she is now 15 months old. She is the best dog we have ever owned (other than our purebred pekingese, Sandy, lol!) We got Molly to be a companion to Sandy. Molly is so well behaved, her temperament is excellent, not aggressive in any way and looks forward to treats after her trips outside. She doesn't shed at all. It did take us longer to potty train her than it did for Sandy. I wish her fur had stayed the color it was when she was born, but the brown is now a faint beige and the brown ears are now a gray. She is still beautiful though! Molly and Sandy get along wonderfully and it's the best thing we ever did for Sandy! Molly is smaller, only 12 lbs. but she is stronger than Sandy who is 20 lbs. She can pull Sandy off the sofa if they are playing tug of war over a toy. She sleeps in her crate every night, but she loves to cuddle and loves to sleep with you as well. She's the first dog we have owned that likes to sleep on her back with all fours up in the air! 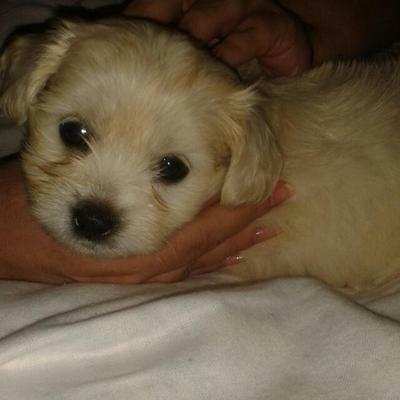 She is a cutie and looks more like her mother, who was a purebred Maltese. 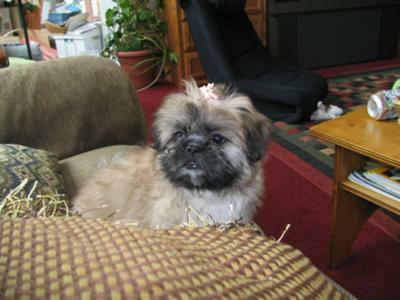 Her dad was a purebred pekingese. She comes to the side of my recliner for me to pick her up. She will lay anywhere she can find a spot! The only cons I have seen is her stomach itches, so we think she is possibly allergic to grass and she is very sensitive to light. She loves to run and is very fast! She enjoys her exercise. Sandy cannot keep up with her. It's a joy every night to watch them run and play. Her hearing is excellent. She can hear the doorbell when no one else does. She definitely alerts us if someone walks upon the porch. 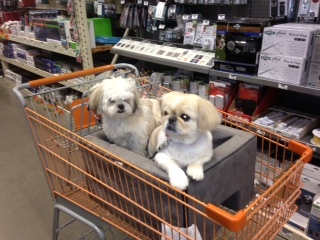 This is a picture of Molly and Sandy on one of their many trips to Home Depot. Molly is on the left, Sandy is in front. 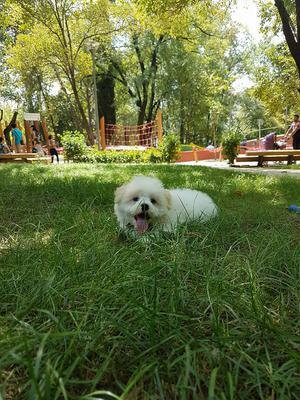 We would highly recommend this cross breed, and are currently looking for a breeder in Georgia to get another one! My wife and I got Winnie a couple months ago, and she has brought nothing, but joy to our lives! Winnie was born on 12/20/2014. She is a little piggy and is always looking for food and treats. She loves to nip at our shoes and woof at us if we're not giving her enough attention. She is very affectionate and playful. Unlike a lot of small dogs we've come across in the past, she rarely barks. She just sits and stares when other dogs walk by our house, and just wants to go meet them. She attended her first puppy training class this past Saturday, and the trainer commented on how she was such a social butterfly, and how cute she was with her little underbite. Winnie is a picky eater, so we have to mix her dry food with some canned cuisine for her to eat. We love her so much that we do not mind spoiling her at all. She has moments where she's naughty, but hopefully the training will improve her behavior as she gets older. She's still a little puppy, so it's expected? She is our first furbaby, so it's a fun learning experience for the both of us. She is a real cutie!! Looks like our Pixie girl! We got her in Minnesota from a rescue. Her and her half sister, Tiki, were breeder surrenders...we took both! They are Maltese-Pomeranians. Winnie is adorable! 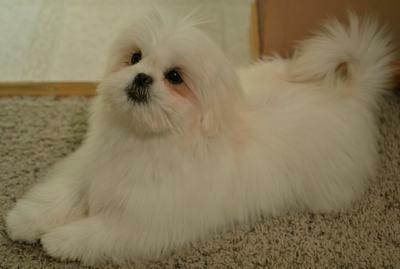 My Maltese Pekingese puppy is a bundle of joy and lovable. At 7weeks she is very intelligent and cry when she wants to go outside to do her business. Loyal and trainable. One word to describe Bella is LOVE. 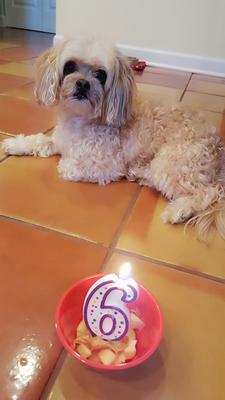 My Zoey is 6 years old. I've had her since she was a newborn pup, just a couple months old. Her dad was brown & mom was pure white color. 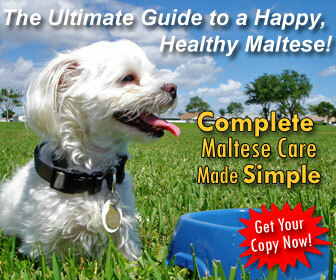 My Maltese Peke mix is the perfect companion & true protector . She's great with the children but can care less when people come to visit. 😊 extremely intelligent & stubborn at times so she fits right in lol. High energy & extremely playful. I would be lost without her! 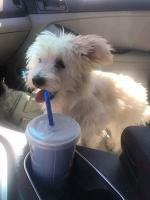 We had a Maltese Peke mix for about 10 years, got him when he was 5 yrs old. Mickey passed away 5 years ago from heart problems. Yes, we are still feeling lost without him. They are one of the best mixed breeds and hard to find. Love that little Zoey and enjoy every minute you have with her. What a darling and photogenic boy! 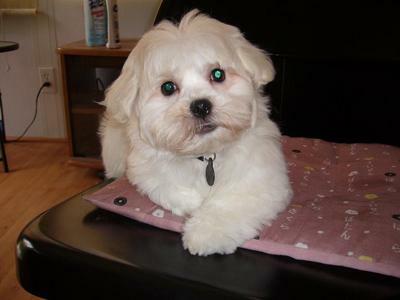 Such a cute Pekingese Maltese mix puppy you have, enjoy him! He's hyper when left in the cage while were gone, and he doesn't listen sometimes. He even potties inside if he isn't on schedule. He loves the kids, even letting them pull and sit on him even though I don't really want that so I'm quick to act if they get too rough. Sometimes if he's happy excited, or scared he will pee. He's a great guard dog and barks when there's a stranger, but he'll get use to you. He hasn't ever bit me, or anyone else ever. He was born on December 23 so he's almost a Christmas pup! He's a year old now, and he's so cuddly. We love him so much! This is the owner of cheech and chong, I had to get rid of them. I miss them so much.if you r their new owner. Plz let me know in the comments. They are so cute, thanks for sharing their story, keep enjoying them.....we need them as much as they need us. They are a pair of cutie patooties. These two boys are so handsome!